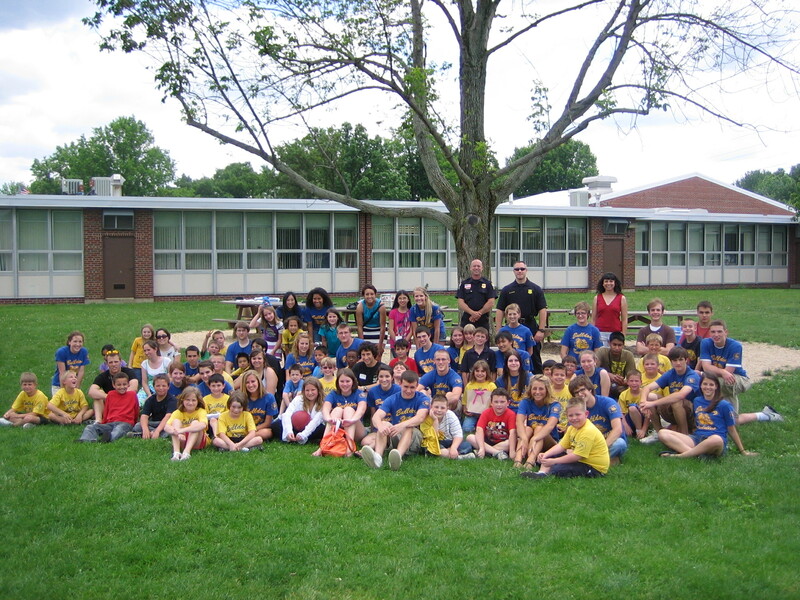 It is with great pride that we conclude the 2009-2010 school year at Olmsted Falls Schools. There is certainly much to be grateful for as we end this year. Even as our District struggled financially, we were still able to maintain our reputation for excellence. Olmsted Falls School District received the highest possible rating from the Ohio Department of Education on the Local District Report Card for the 10th consecutive year this year. The District was also recognized both regionally and nationally as it was named among the top 15 school district’s in Cleveland Magazine’s annual “Rating the Suburbs” issue (June 2010), and was named among the “Best Communities for Music Education in America” for the fourth consecutive year in a row. We want to extend our sincerest thanks to the Olmsted community for supporting the operating levy on the ballot this past February. The passage of this critical operating levy – our District’s first in eleven years – helped put a halt to the many cuts that had begun eroding the quality of our District programs and services. With our District not receiving these new operating dollars until January 2011, budgets still remain tight. But it is with renewed optimism and hope that we look ahead. We continue to monitor additional cuts to State funding on the horizon very closely, but are pleased to be able to suspend the cuts to local programs and services that had been put into effect over the past school year. We’ve worked hard this year to communicate openly and frequently with our community. We hope that parents and other interested community members have enjoyed reading the regular blog updates provided throughout the year. The District’s blog will be updated periodically during the summer months, and we plan to continue with this regular on-line communication tool regularly throughout the coming school year. Finally, during these summer months, I want to once again encourage our students to participate in the Cuyahoga County Library’s Summer Reading Game – “Books Ahoy!” Remember that all Olmsted Falls School District students in grades K-8 have already been pre-registered for the Summer Reading Game, so please be sure that they take advantage of the opportunity to enhance their reading skills and their love of reading during vacation. I also want to encourage our parents to make reading a personal priority this summer. The best message we can send to our children about the importance of reading is to set an example ourselves. In closing, to our students and staff, I wish you a safe and enjoyable summer break. To our community, I extend heartfelt thanks for your continuing support and for the important role you play in making Olmsted Falls School District an exceptional place for our students to learn. I want to make you aware that the Cuyahoga County Library System is in the process of making several major decisions regarding our county library system. These decisions could have major impacts the Olmsted Falls library as well as our community. Here is a recent article from the Cleveland Plain Dealer that provides additional information (click here). If you have visited the Olmsted Falls library, you know that it is undersized and outdated. While it is housed in a lovely historical building, the facility simply does not meet the needs of our growing community. Because our library facility is not adequate, many residents are forced to travel to neighboring communities to use other Cuyahoga County Library facilities. This is a very important issue for our community, our children, and our residents. I would encourage you to submit a comment to the Library system (click here) and share how important our library is to this community. Additionally, please consider sharing your thoughts regarding how a new library facility, in our community, would act as a resource for our residents. Olmsted Falls Schools bid farewell to seven dedicated staff members retiring this year. Their combined service to Olmsted Falls Schools totals 180 years! State Senator Tom Patton (Back, left) and State Representative Mike Patten (Back right) were on hand to help recognize the talents and contributions of this year’s retirees at the annual Records Day breakfast held June 9th. Retirees pictured (L to R): Ann Sidun (32 Bulldog years); Lucia Pretzloff (17 Bulldog years); and Monica Annable (17 Bulldog years). On behalf of the Olmsted Falls Schools and the Olmsted communities, we extend our heartfelt appreciation to each of this year’s retirees for their commitment to the education and well-being of our children. These valuable individuals, and their impact on the District, will be greatly missed. Congratulations to each of them, and best wishes for a happy, healthy retirement. Olmsted Falls Kiwanis Club President John Jacobs (far right) congratulates Kiwanis Employee of the Year winners (L to R): Transportation Manager Alan Cantrell, Central Office Secretary Joyce Thomas, and Middle School Instructional Coach Lisa Williams. Staff members are nominated annually by fellow colleagues through a written nomination process. Nominations are reviewed and selected by a special committee of Kiwanis members. 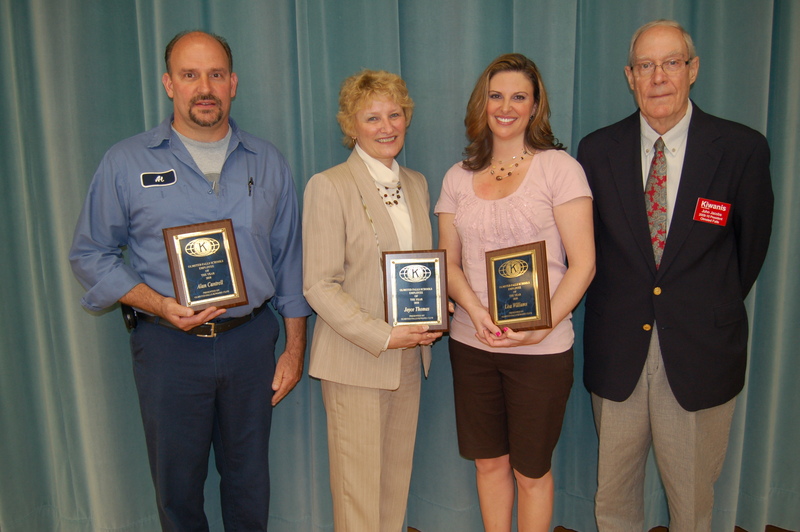 Congratulations to the 2010 Employees of the Year, and thank you to the Kiwanis Club for their continued support of the Olmsted educational community. Art teachers and students at Falls-Lenox and the ECC joined the world’s largest kids online art museum this year. Artsonia provides a free online art community where schools can scan and post student art projects throughout the year. Parents are invited to set-up free on-line accounts, which enable them to view and share their child’s artwork online with family and friends. In less than six months, teachers and students at Falls-Lenox and the ECC have created an impressive online presence in their museum, publishing more than 12,500 pieces of student artwork. In fact, the Falls-Lenox/ECC Online Art Museum has been ranked as the #1 Artsonia program in the State of Ohio and #2 program in the Country. Congratulations to students for their great artwork, and to the teachers whose dedication and enthusiasm have made this innovative project a success. In addition to providing an excellent way to showcase student artwork, schools can earn 15% when parents purchase custom keepsakes with their child’s artwork. Falls-Lenox/ECC Online Art Museum has already earned more than $500 for their arts programs. Teachers and students at Olmsted Falls Intermediate School and Olmsted Falls High School also began using Artsonia this year. More than 1,250 pieces of artwork have been published by Olmsted Falls High School students; and more than 3,800 pieces of artwork have been published by Olmsted Falls Intermediate School students. UPCOMING EVENTS – ALL WELCOME! July 9th, 10th & 11th – Olmsted Falls Kiwanis Presents “The Carson & Barnes Circus” – Please click here for additional event / ticket information. Congratulations to the 267 members of the Class of 2010! Parents, family and friends gathered at Cleveland State’s Wolstein Center last Thursday evening to celebrate Commencement. Valedictorian Steffany Meredyk, Salutatorian Adam Broski and Class President Mark Mills were featured speakers, along with Board President Frank Pedicini, Superintendent Dr. Todd Hoadley and Principal Dr. Robert Hill. 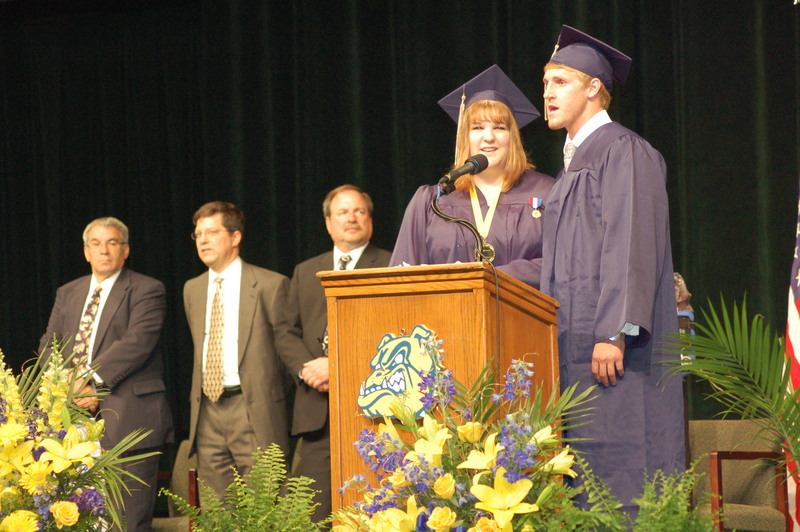 Holly Miller and Brett Emerine lead Class of 2010 in final singing of OFHS Alma Mater at the Commencement ceremony. In addition to Commencement, graduates and their families and friends, celebrated at the annual Baccalaureate Service held in the OFHS Auditorium last Wednesday evening. Reverend Jim McClaren from Fields Methodist Church, Reverend Ron Dauphin from Olmsted Community Church, and Father Wally Hyclak of St. Mary of the Falls Catholic Church officiated the service which was sponsored by the Olmsted Ministerial Association. Rev. Jim McClaren, Rev. 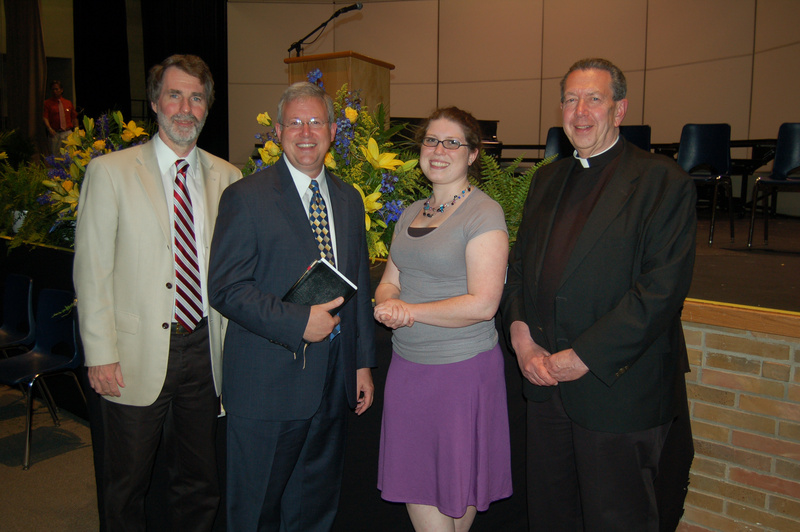 Ron Dauphin, St. Mary of the Falls Youth Minister Tricia Frey, and Fr. Wally Hyclak at Baccalaureate. 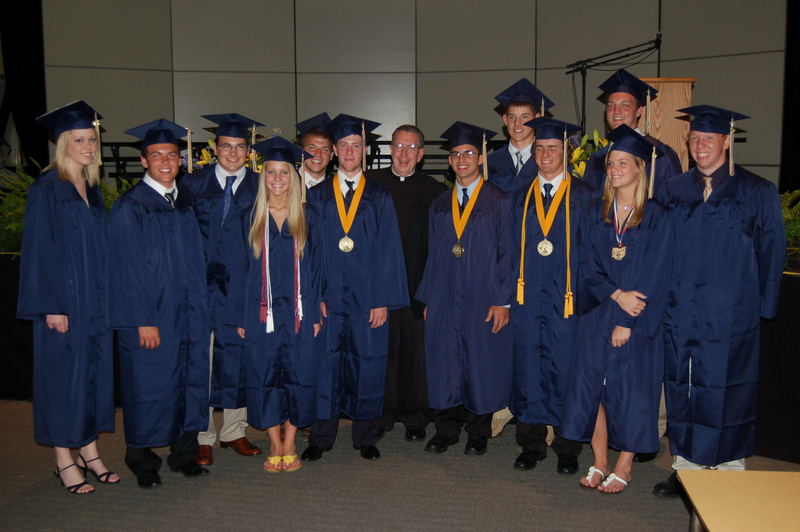 Class of 2010 graduates who attend St. Mary of the Falls with Father Wally Hyclak following Baccalaureate Service. Members of the Class of 2010 also participated in the annual Senior Honors Program where awards and scholarships were presented on Wednesday morning. Many Thanks: Olmsted Falls High School would like to thank parents and community members for their support of the Class of 2010. Whether volunteering, donating in-kind or supporting the Local Scholarship Program, the students of OFHS are truly fortunate to be surrounded by such a caring community. Students and staff extend special appreciation to the parents who volunteered to work the senior cookout last week. Special thanks also go out to Phil Moody and IGA, K&K Portage Meats, Cutting Garden, and Schuster’s Greenhouse for their contributions and donations to year-end events as well as activities throughout the year. Finally, OFHS also wishes to thank the graduates of the Class of 2010 for their donation of a magnolia tree for the high school courtyard. In closing, OFHS invites parents of students in the Class of 2011 to get involved. There are a number of opportunities to help make your child’s senior year a memorable. Contact the High School Guidance Office 427-6116 to volunteer. Congratulations once again to the OFHS Varsity Baseball Team on their first-ever run at the Division I State championship! While in the end, the team was defeated in the final four in Columbus on Friday, the team has many accomplishments and firsts to celebrate this season. Way to go Bulldogs! Also competing at the State level last weekend were members of the Olmsted Falls High School Track Team. Congratulations to the Girls 4X400 Meter Relay Team (Dayna Roberts, Allison Duber, Megan Coughlin and Kelsey Snider) for finishing 13th in the State with a time of 3:57.82. 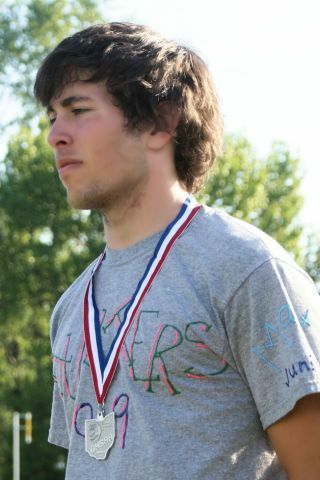 Congratulations to pole vaulter Matt Stenger who finished 6th in the State with a height of 15′ O”. Matt’s best vault this year was 15’1″, which is now the school record. 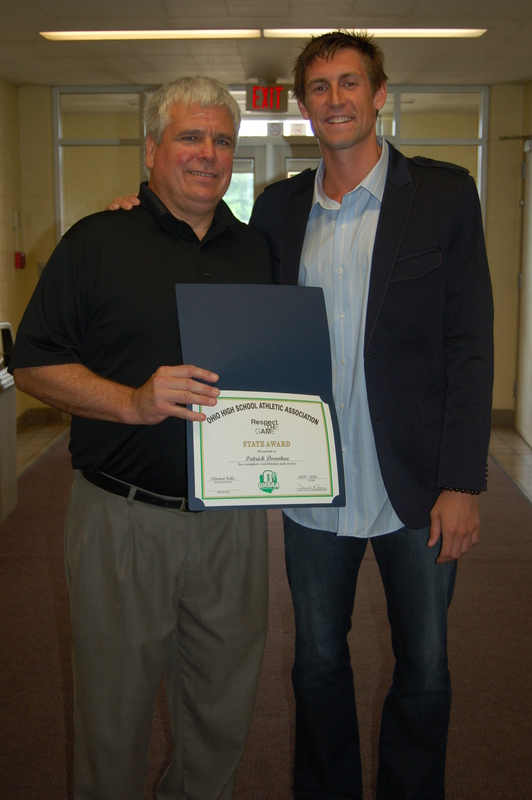 Olmsted Falls Alumnus Mike Gansey returned to his Alma Mater last week to help present the “Sportsmanship, Ethics & Integrity Award” to his former basketball coach Pat Donahue. 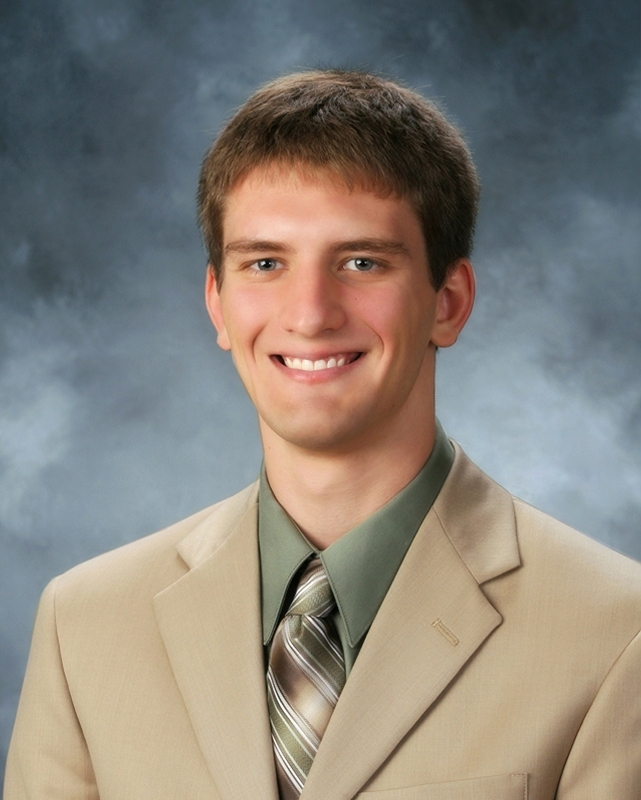 Gansey spoke of the personal and postive impact Coach Donahue had on his basketball career. Gansey currently plays basketball professionally in the U.S. and abroad. For those parents needing to designate a single, alternate pick-up / drop-off address for their student for 2010-2011, the deadline for submitting Alternate Transportation Forms is Tuesday, June 15, 2010. Please click here for additional information and to access Alternate Transportation Forms for the 2010-2011 school year. Olmsted Falls School District encourages participation in the Cuyahoga County Library’s Summer Reading Game as a way to maintain and enhance important literacy skills over the summer months. This year’s Summer Reading Game “Books Ahoy!” began last Saturday (June 5th). All Olmsted Falls School District students in grades K to 8 have been officially registered to participate in this year’s program. The Cuyahoga County Public Library’s Summer Reading Game – “Books Ahoy!” – runs through August 7th. Registration allows for participation in “Books Ahoy!” at any Cuyahoga County Library branch including Olmsted Falls, North Olmsted, Berea and Middleburg Heights. Please contact our local Olmsted Falls Library branch at (440) 235-1150 with any questions. 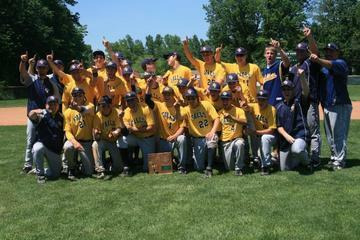 Varisty Baseball Team celebrates Division I Regional Title following 7-6 victory over Perrysburg on Friday. ﻿Congratulations to the OFHS Varsity Baseball team on their 7-6 victory over Perrysburg on Friday. This latest win by the Bulldogs clinched the school’s first-ever Division I Regional Baseball Title and sends the team to the State Final Four Tournament in Columbus this Friday, June 4th. Olmsted Falls will play against St. Edward’s Friday at 1:00 p.m. at Huntington Park, home of the Columbus Clippers. Click here for a link to Huntington Park. Any student who wishes to travel to the game must present a signed parent note granting them permission by the end of the day on Thursday, June 3. Notes should be dropped off in the student office. We will compile a list of any student who plans to attend the game and those students will be permitted to take any exam that they missed during the make-up time on Monday or Tuesday. Due to the 1:00 start time for the game, please encourage students to take exams during the first exam block. Please visit www.ofbaseball.com for more on the team’s historic journey to State. Cleveland Magazine’s annual “Rating the Suburbs” issue has just hit newsstands, and Olmsted Falls School District earned a ranking of 14th among the 57 area school districts rated. The annual survey rates school districts based on a number of categories including ACT/SAT scores, proficiency test results, attendance, graduation rates, number of AP courses offered, National Merit scholars, and more. Congratulations to the staff, students and parents of Olmsted Falls School District for the important part you play in keeping our District excellent! ﻿Congratulations to our OFHS Academic Team who concluded their already impressive season with a strong showing at their first National Academic Quiz Tournament in Chicago this past weekend. The “A-Team” finished in a tie for 27th place! The B-Team finished the tournament in 124th place overall. These outstanding performances were on a national level against teams from across the entire country. More than 1,100 students competed at the NAQT in Chicago. Special congratulations to junior Jim Coury for emerging the national competition as the #12 individual player in the whole U.S.! Congratulations again to all! Academic Team members competing in Chicago included: Jim Coury (Jr.), Mike Coury (Jr.), Emily Nageotte (Jr.), Marty Mendenhall (Fr. )Michaela Killik (Jr.), Chris Traylor (Jr.), Eric Miranda (Jr.), Natalie Brdar (Jr.), Pam Keller (So. ), and Sohan Vartak (So.). 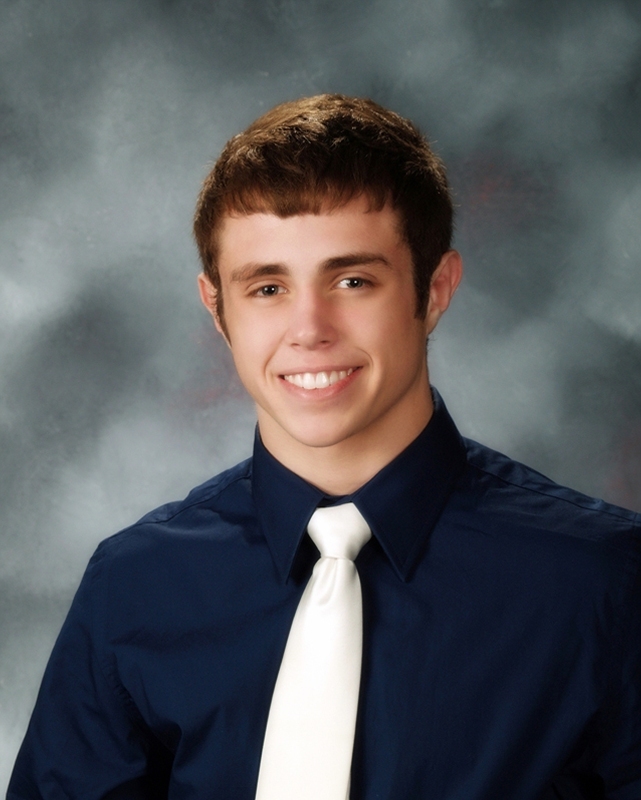 Olmsted Falls High School seniors take part in several events this week. The traditional ending to their time at OFHS includes tomorrow’s Senior Breakfast/Honors Assembly (6/2), the Baccalaureate service tomorrow evening (6/2) at 7:30 p.m., and Commencement Ceremony this Thursday, June 3rd at 8:00 p.m. Click here for link to the High School web page for additional information. Olmsted Falls School District encourages participation in the Cuyahoga County Library’s Summer Reading Game as a way to maintain and enhance important literacy skills over the summer months. All Olmsted Falls School District students in grades K to 8 have been officially registered to participate in this year’s program. Beginning this Saturday, June 5th, simply stop by any Cuyahoga County Library branch or log on at www.cuyahogalibrary.org to get started. (User name for the Summer Reading Game is student’s first and last name – with no space in between.) The Cuyahoga County Public Library’s Summer Reading Game – “Books Ahoy!” – runs from June 5th to August 7th. Registration allows for participation in “Books Ahoy!” at any Cuyahoga County Library branch including Olmsted Falls, North Olmsted, Berea and Middleburg Heights. Please contact our local Olmsted Falls Library branch at (440) 235-1150 with any questions. For those parents needing to designate a single, alternate pick-up / drop-off address for their student for 2010-2011, the deadline for submitting Alternate Transportation Forms is Tuesday, June 15, 2010. Please click here for additional information and to access Alternate Transportation Forms for the 2010-2011 school year. Congratulations to PTA member Linda Parkowski (OECPTA and Falls-Lenox) for receiving the annual Helping Hands Award. 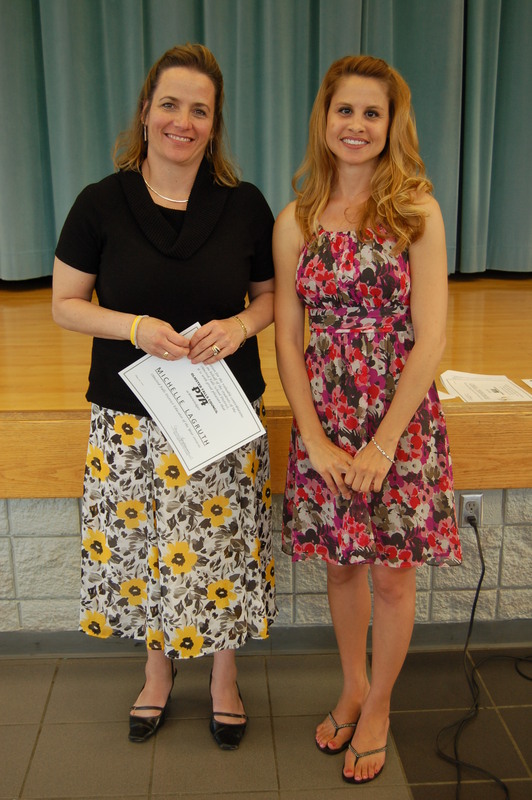 Mrs. Parkowski was also named Volunteer of the Year at the annual PTA Volunteer Celebration and Installation Dinner held last week at OFMS. Other Volunteer of the Year finalists included: Kim Cleary (OFIS), Julie Corrigan (High School), and Cindy Zahorchak (OECPTA). Thank you to each of these parents for all of their work on behalf of the students and families of the Olmsted Falls School System. 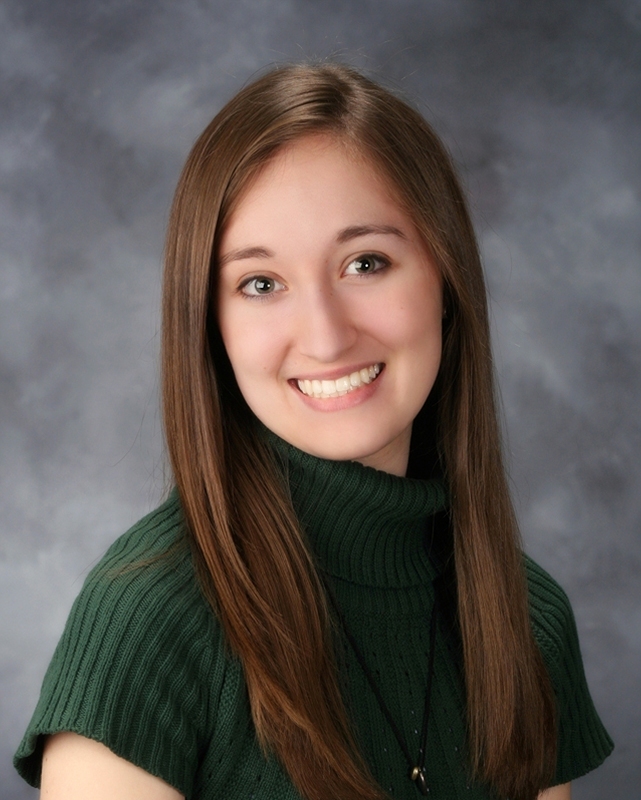 Congratulations also to Falls-Lenox 3rd grade teacher Michelle LaGruth on being named PTA Educator of the Year for here ongoing dedication to the Parent Teacher Association. L to R: Volunteer of the Year Linda Parkowski with fellow finalists Kim Cleary (OFIS), Julie Corrigan (High School), and Cindy Zahorchak (OECPTA). PTA officers for the 2010-2011 school year were also installed at the event. Unit Presidents for the coming school year are: Mercedez Hathcock (PTA Council); Leslie Ziegler (Early Childhood PTA); Linda Parkowski (Falls-Lenox); Leann LaPinta (OFIS); Deb Woodruff (Middle School); and Pam Portik (HS). Congratulations to 2nd grader Elizabeth Gonazalez for her award-winning entry in the annual Ohio PTA Reflections contest. 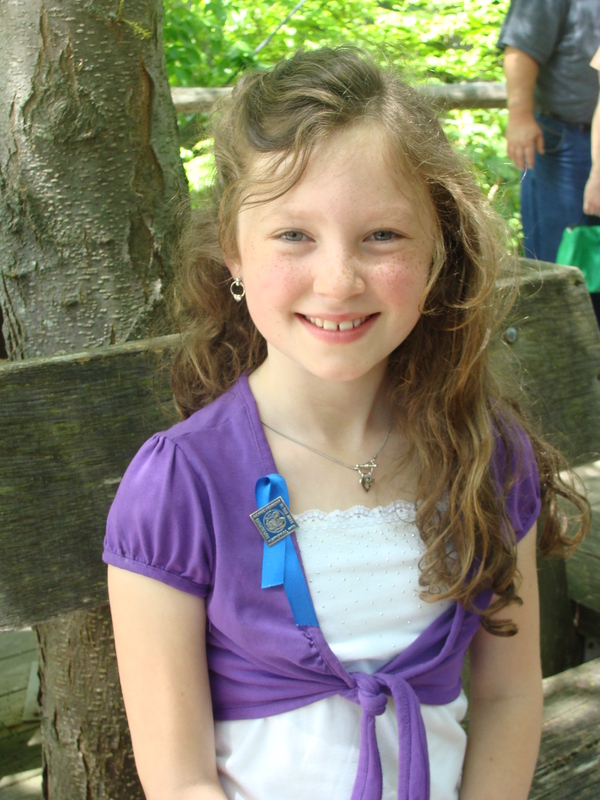 Elizabeth’s entry in the literature category earned top honors as received the “Award of Excellence” in her category. Writing with the theme “Beauty is…”, Elizabeth’s essay was the top winner in its category for the entire State of Ohio, earning her and her family a trip to the Columbus Zoo for a special presentation ceremony (see photo above, left). 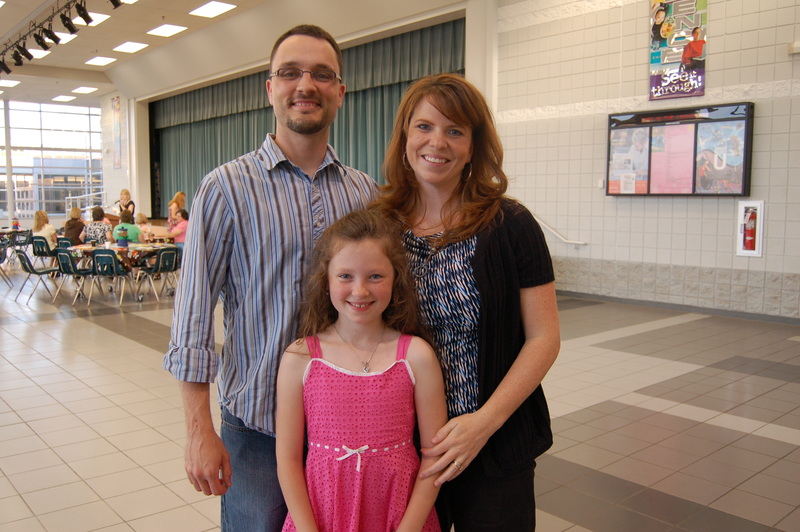 Elizabeth and her parents were also honored at the annual Olmsted Falls PTA Celebration dinner held last week (see photo above, right). Outstanding job Elizabeth! Bulldog Football Team Volunteers at Ronald McDonald House. 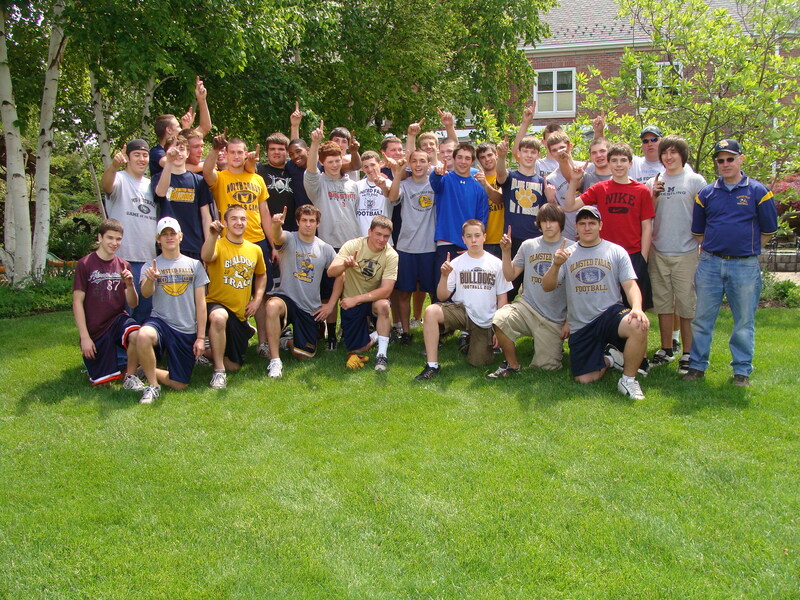 The Olmsted Falls Bulldog Football Team volunteered their time and service to the Ronald McDonald House on Sunday, May 16th. The players and coaches weeded, pruned, and moved more than 15 cubic yards of mulch to help this RMH spruce up for spring. This great effort by our players and coaches helps add to the welcoming environment RMH provides for families using this facility as their home away from home while their seriously-ill children are receiving treatment at one of Cleveland’s area hospitals. Parents, staff and fellow students were invited to attend a special living history event at Falls-Lenox last Thursday as students created a museum of historical figures in the gymnasium. Individual student stations filled the space with each student having a “button” to bring their chosen historical figure tonight. 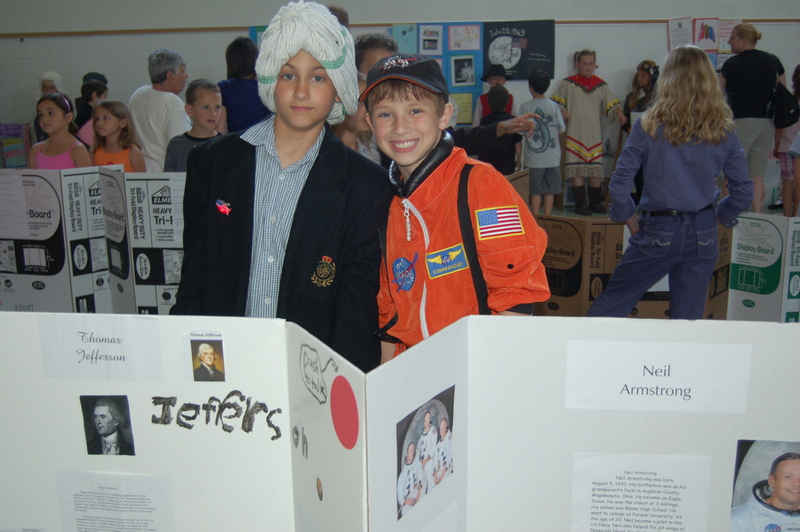 In addition to poster boards with facts and pictures, students also dressed as their historical figure. Kudos to students and staff for coordinating such an innovative learning event! Bulldog Buddies Group at End of Year Ice Cream Social at Falls-Lenox Primary School. Earlier this year, students from Olmsted Falls High School were paired up with younger students from the Early Childhood Center, Falls-Lenox Primary and the Middle School as participants in the “Bulldog Buddies” program. Piloted last year on a smaller scale, the “Bulldog Buddies” program really took off this year with 65 Big Buddy/Little Buddy pairings in total. Each High School “Big Buddy” made weekly visits to their assigned “Little Buddy” and took part in a variety of personalized activities ranging from tutoring and homework assistance to games and sporting activities. Kudos to the efforts of school counselors Nate Artino (OFHS), Angie DiMassa (ECC/Falls-Lenox), Kathy Suvak (OFMS), Kristal Reis (OFMS) and Sherry Davis (OFHS) whose collaboration helped expand this year’s program. Additionally, special thanks to Officer Jackie Ketterer from the Olmsted Township Police Department and Police Athletic League who supplied all the Big Buddy and Little Buddy t-shirts, and also spnsored the end of the year ice cream social event. Students at Olmsted Falls Middle School volunteered their time to help beautify the school’s outdoor courtyards last week. The students did a fabulous job tending to the planted areas and pulling weeds. Their efforts made a big difference and are being enjoyed by all. Great job!